Conceived and designed by Alice Jacobs, a 2012 alumni of Glasgow School of Art, and our young team at Flux Laser & CNC Studios, all the furniture is made in-house at our studio in The Whisky Bond and our larger fabrication space. The collection utilises our experience with digital fabrication materials, from conception through to the finished product. 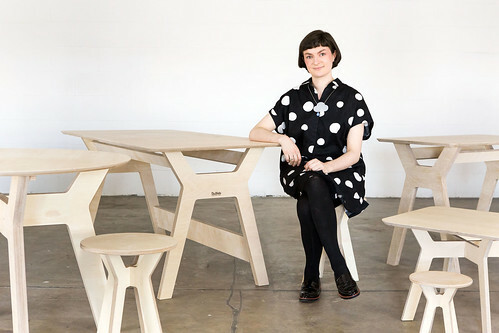 All the furniture is CNC (computer numerically cut) from FSC sustainably sourced birch plywood. They have a maximum of six pieces and four screws, coming together in less than five minutes. Every piece is sanded and hand finished with a spill-proof and robust blend of natural oils, leaving a satin-matt finish. And, if you would like to customise your furniture, that’s not a problem. All our pieces will be available sanded, but unsealed, so you can paint, stain or varnish your Ply-Works piece to fit your style.